This is the chall enge at the heart of our faith – Who is at the center of your life? Is it Me or God ? If I am an honest is God an insurance policy that I have just in case my other plans don’t work out? Is my career the most important thing and I am happy to come to church as long as God doesn’t get in the way – or ask me to do anything that will disturb my plans? As long as I keep God in a box that is labelled ‘Sunday’ or ‘Church’ he won’t bother for the rest of the week….. So many of us who call ourselves Christians – live like this…. Spending some much time and energy storing up treasure for ourselves – that we don’t really want God to trouble us….. where do you put your trust? Do you place your trust totally in God ? According to the American Franciscan, Richard Rohr, it is the job of the first half of life – to establish ourselves, to leave home, to build an identity, to get a qualification (might be a university degree) and to start a career. We all need to pass through this stage and therefore we develop a spirituality for the first half of our life – which is more concerned with outer things than inner things, so my Catholicism is and it is often only when a crisis comes along that we are jolted off our path. Often it is when someone we love dies, maybe we go through an illness, and suddenly we start asking ourself – what is life all about? All the stuff that was important about establishing our identity now becomes less important and we start ‘Falling Upwards’ as Richard Rohr calls it – we start to put God in the center. This happened to a young Spanish Nobleman, Inigo Lopez de Loyola – who found himself as a soldier defending the town of Pamplona – in 1521 – when a French Canonball ripped through his legs and shattered his knee. Forced to recover in bed he started to ask himself these deeper questions – and realised it wasn’t just his knee that was shattered but also his self-image, his understanding of himself. Bed ridden for 9 months he dreams about the future – about returning to his chivalrous ways …. But as time dragged on and boredom forced him to read the only books that were at hand – religious books about the saints …. He noticed that he started to have a second type of daydream – instead of returning to be a solider for the King – he would become a pilgrim – a soldier for God.Thus 495 years ago began an journey that leads us to here to this beautiful church today –the Holy Name was founded in 1871 by men who have followed in the footsteps of Inigo. Back recovering in his bed in Loyola, Inigo the swashbuckling soldier (now crippled) notices that he starts to have a second type of dream which is obviously fed by his reading – doing great things for God – outdoing the saints in holiness. He noticed this left him feeling a deep joy and peace that lasted longer the other dreams of future worldly glories ahead…. He had discovered already the fruits of making yourself ‘rich in the sight of God’ … Inigo was becoming Ignatius. He realised that up till then he had wasted too much time chasing ‘vainglories’ – it all seemed worthless now when compared to things of God. The genius of St Ignatius – a great gift for me in my life which I will always be grateful for – is that he allowed God to teach him – and then showed others how to search for God’s will in their lives. He taught us to recognised Spiritual Consolation – the joy and the peace and the love that comes from moving closer to God…. We call this Ignatian Spirituality …. And it is an incredible legacy that has led to countless men and women changing their lives – abandoning our obsession with material wealth and storing treasures that make us rich in the eyes of God. After the fall of the Berlin Wall – the end of Communism – we all hoped for an new age of peace, of stability but in fact what happened was the world became more complicated ….. this new multi-polar world has been marked by Four things – that military planners called VUCA. Volatility, Uncertainty, Complexity and Ambiguity. The world seems to have become less predictable, more scary – Volatile in the nature and speed of change, Uncertain in the lack of predictability, the prospects for surprise. Complex in the different forces and issues, and Ambiguous in that reality is difficult to read now, Confusion seems to abound. This is a confusing and at times scary world…. Where an 80 year old priest is brutally executed during mass, with unprecedented people on the move, with an acceleration of technological change that has never been seen before. St Ignatius gives us a fantastic map to navigate our way through this world. As God so patiently taught him – he wishes us to learn in a similar way – to be taught by God – who longs to be our teacher. It is a map – that helps us to navigate through a hurting and crazy world…. His way of praying helps us to listen to our teacher – even though there is so much to distract us away from these heavenly treasures. And one his sons, Pope Francis, the first Jesuit Pope – is currently in Poland – celebrating mass as we speak with 3 million young people – Francis will be delighted to share such a special day for him ( and all Jesuits) with such a wonderful crowd – including our group of 20 from here. The Pope’s desire will be to share with all those youngsters the Joy of putting God in the center of your life – the Joy of being truly free – knowing that you are loved sinner – the peace that comes from falling Upward and knowing that in the end everything will be all alright. Today we are moving into the Third Week of the Exercises – where we contemplate Christ in his Passion. It is a ‘test’ of discipleship and any elections made in the Second Week. Often a dry and difficult period in prayer – as the mystery of the cross is so difficult to penetrate. 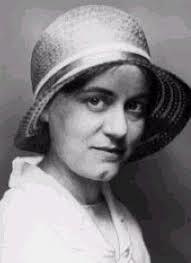 Luckily we have a great saint today – Edith Stein. I am privileged to be celebrating mass today too, so this is my reflection on this great woman. 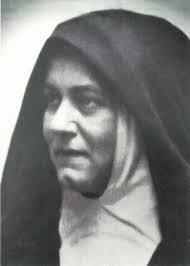 On the eve of the third millennium, John Paul II named three women as new patrons of Europe, one of them was St Theresa Benedicta of the Cross, Edith Stein. She was a saint of the second millennium, who would accompany us into the third millennium, the Pope said. Why was Edith Stein so close to the Popes heart? Why did he feel she was such a powerful patron for us as we entered the new millennium? It may be helpful to think of three stages to Edith’s Life 1) The towering intellect and public genius 2) Conversion and an irresistible call to a hidden contemplative life 3) Her embrace of the cross and Confronting evil in Auschwitz…. And in this incredible journey she synthesised the dramatic history of the twentieth century in her own heart. So the second phase of her life began – resuming lecturing after the War – she read the New testament, and Kierkegaard and interestingly the Spiritual Exercises – all of which made a deep impression on her (notice she only read the Exercises – she didn’t make them) However the breakthrough was when visiting a friend she picked up the biography of St Teresa of Avila and read it all night – at the end she simply said ‘this is the truth’ – she was to be baptised a Catholic and her work became a combination of Scholarship and Faith ….. ten years later she entered the contemplative Carmelite life – and took up the religious name Teresa Benedicta of the Cross. Like our own Hopkins – she was to stop writing as she enthusiastically immersed herself into religious life. This self-imposed silence was to finish as she published a book called ‘The Science of the Cross’ to mark the 400th anniversary of St John of the Cross birth….. This immersion into the mystery of the Cross was to be prophetic as she was to imitate her beloved Jesus ….. He turned his face to Jerusalem and his passion – she was to be taken to Auschwitz with her sister who had followed her into ‘Carmel’ . The rounding up of Jewish converts was in retaliation to the Dutch Bishops letter condemning Nazism and its ethnic cleansing. Her last words to her sister were Come we are going with our people’ as they were rounded up with 987 Jewish Christians and sent today to the gas chambers. So three steps – from an intellectual tower, to a silent life of adoration and then this profound welcoming of the cross. One of my fellow Jesuits said yesterday – so many of us want Christianity without the cross – let us pray with Teresa Benedicta that we learn to serve our crucified Lord.